For those of you who don't know, I've pretty much found out how to edit Chief's armour in Halo 3 to any of the armours from multiplayer which can be found here. I recently tried to change Chief's armour on Halo 4 but instead of the options being in the [HLMT] section, I think they are in [MODE] instead. I scroll down to "permutations" and change the index numbers to different armour parts, but every time I go in game the armour piece just gets removed completely. On top of that I can't even change the color of the armour? If anyone knows how to change the pieces manually or even just replace Chief with your multiplayer spartan please do tell. As much as I love playing as Chief, it's also nice to be able to play as your own character from time to time. 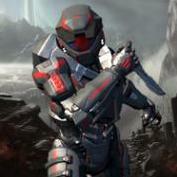 The campaign spartan has all the multiplayer variants stripped. The multiplayer version of the mode tag would need to be injected (using a self-compiled build from the dev branch of assembly), but as I found making my video, you have to manually strip the shaders for variants you arent going to use as well or you will run out of game memory. On top of all that its gonna look as terrible as you see in my video until if/when injection is further refined to support the relevant data. Thanks for the reply dude, you've been a major help. I was actually originally going to use that video as an example believe it or not, I'm already subbed to your channel.